Survey locations in the Mediterranean. Image source: ION. Exploration in the Mediterranean Sea has experienced significant renewed interest over the last decade, with exciting, play-opening discoveries in Israel, Egypt and Libya. ION has taken an innovative approach in order to rapidly and cost-effectively develop an integrated dataset to aid understanding of the whole Mediterranean, which can be used as the framework for future exploration programmes and to challenge existing basin models. The dataset consists of newly acquired BasinSPAN™ data and reprocessed data from both industry and academic sources. These surveys have been processed concurrently to provide a consistent velocity model across the Mediterranean and generate a fully integrated geological and geophysical interpretation using seismic, well, gravity and magnetic data. ION has created a unique dataset in the region to support the next phase of exploration, with licence rounds expected in the near future. Seismic Section from the Mediterranean. Data source: ION. Figure 1: Interpreted section of seismic outlined in black on foldout line (above). Image source: ION. The offshore Mediterranean basins are the focus of renewed interest since the 2008 discovery in Libya, the Tamar and Leviathan discoveries in Israel, and the recent Zohr discovery in Egyptian waters. ION’s regional Mediterranean programme demonstrates the utility and exploration value of a fully integrated seismic dataset and velocity model across the entire basin. Interpretation of these data provides the context to correlate known discoveries into those new and complex underexplored areas. The present-day configuration of the Mediterranean Basin is dominated by the Cenozoic collision of Africa and Eurasia, creating compressional and back-arc extensional tectonic settings. The current tectonic elements and basins have overprinted pre-existing Tethyan margins that stretch from Algeria to the Eastern Mediterranean and extend to the Arabian Peninsula. The variability in basin types and ages provide significant hydrocarbon potential for a wide variety of play types, with source rocks of Palaeozoic to Cenozoic age. The Mediterranean contains several well-known plays: biogenic Pliocene gas offshore Nile Delta; salt-generated structural plays of the Sabratha Basin; and the Po Valley/Adriatic Sea gas play. There are also areas where commercial discoveries have been elusive and areas which have yet to be explored with the potential for new play types. Figure 2: Example line in Cyrenaica area from reprocessed Libya dataset highlighting areas of improved imaging and features of interest. Image source: ION. Offshore Libya has attracted exploration interest for some time. The prolific petroleum systems of Libya have generated proven oil discoveries of about 130 Bbo, the majority of this onshore. The offshore extensions of these petroleum systems are largely unexplored. The success of the 2005 EPSA IV licence round highlighted industry interest in the area and the subsequent play-opening Arous Al-Bahar gas discovery in the offshore Sirt Basin in 2008 confirmed the continuity of the onshore Cretaceous carbonate play into the Sirt Basin. The potential of Eocene marls and limestone reservoirs lying unconformably on the Cenomanian and Turonian carbonate blocks remains poorly understood. Discoveries continue to be made in the more developed Sabratha Basin, but several structures and deeper targets remain undrilled. Figure 3: Example of improvement in imaging with modern processing offshore Libya. Image source: ION. The Nile Delta region has undergone several phases of exploration, but is dominated by Plio-Pleistocene gas discoveries in stratigraphic and structural traps. Exploration of deeper Miocene and Oligocene strata has had varying success and has been slower to develop. However, even with the extensive dataset across the area, fundamental questions regarding deeper stratigraphy and structure still remain. Development of new exploration plays in deeper water and older stratigraphy requires a better understanding of the underlying basement architecture and stratigraphy. ION, in collaboration with the Egyptian Natural Gas Holding Company (EGAS), acquired a deep, long-offset line across the central and western parts of the Nile Delta, imaged to 40 km depth. One of the critical observations from these new data is the >12 km thickness of sediment to the west of the Delta. The Nile Delta 2D line was processed using ION’s WiBand™ broadband processing solution, which provides deghosting that enhances the bandwidth of the data by recovering low-frequency components of the data and performing multiple suppression prior to waveform inversion. High resolution non-parametric inversion (GMO Tomography) incorporating anisotropy combined with the use of full waveform inversion created the detailed velocity model in the complex strata below the Messinian salt (Figure 4). Interpretation of crustal events (basement and Moho) using the new migration velocities calibrated with potential field data were combined to create high quality depth imaging. The integration of these data (potential field, refraction and PSDM) support the interpretation, addressing questions of crustal structure and the nature of the basin development. Recent discoveries and the presence of thick sediment lend support to source rock maturity continuing beyond the areas previously predicted. Figure 4: Nile DeltaSPAN velocity model highlighting the modern techniques used to maximise the accuracy of the velocity model and improve the quality of the deeper imaging. Image source: ION. Exploration successes in the offshore Ionian, southern Adriatic, and Sicilian Channel occurred predominantly from the 1970s to the 1980s. Oil discoveries within the Apulian platform were made in the 1990s and gas discoveries were made in the Gela foredeep of the Pelagian Basin beginning in the early 2000s. Despite intensive onshore and shallow water exploration, there remains significant underexplored offshore potential, including searching for known plays along strike and new play types. Both the North African and Southern Eurasian margins developed as carbonate-dominated platforms on the margins of the Tethyan Ocean. The complex Mesozoic palaeogeographies (shallow water platforms and intervening deep water euxinic basins) were controlled by extensional phases and later inversion. Proven hydrocarbon plays in structural traps in the up-dip platform carbonates are thought to be sourced from basinal organic-rich mudstones. Middle Eocene Alpine orogenic events across the margin resulted in the Apennine fold belt having an eastward migrating subduction system and the development of foreland and back-arc basins. The east–west trending Maghrebian thrust belt of North Africa, the Calabrian Arc and connected north–south trending Italian Apennines show significant variability in the width and deformation style along its strike. Progressively younger foreland fold-thrust belt settings characterise the compressional system and are important to hydrocarbon generation and accumulations sourced from either terrigenous flysch or mature pre-Alpine Mesozoic strata. Figure 5: Geoseismic section (PSDM) of the Calabrian Arc from Sicily to the Ionian Abyssal Plain demonstrating the complex structure of the Arc with deformation younging towards the south-east. Thick deformed and undeformed Messinian evaporites dominate the Outer Arc and foreland. Improved sub-salt imaging provides uplift of the sediments and structures below. Image source: ION. Reprocessing of two legacy datasets, MS (acquired 1970–82) and CROP (acquired 1988–95), using ION’s BasinSPAN™ processing workflow, has been integrated into the interpretation and regional velocity model. These data span the complex and varied domains of the central and western Mediterranean basins, providing a new look at the petroleum systems and multiple play types. Identified analogue plays on the Apulian Platform include karsted carbonate reservoirs and shelf-edge carbonate deposits. Fractured carbonate reservoirs in sub-thrust plays sealed by flysch are another attractive candidate. The Calabrian Arc remains virtually untested with only nearshore fields in the Cretone Basin and academic wells which only penetrated the top of the Messinian evaporitic section in the deep basin. Inverted extensional structures in the thick Mesozoic and Cenozoic strata underlying relatively undeformed Messinian evaporites are compelling, but are located in ultra-deep water (Figure 5). More mature and shallow water areas, such as the Pelagian Basin offshore Sicily, Malta and Tunisia, contain multiple play types and multiple source rock intervals that are working in Sicily and Libya/Tunisia. These plays are likely to be present in the Maltese offshore, but exploration efforts are hampered by boundary disputes and paucity of data. A younger Oligocene rift basin with a thick post-rift section in offshore West Sardinia may also contain an active petroleum system. Multiple plays in the pre-, syn- and post-rift sections are possible, with several source and reservoir intervals that could be sealed by Messinian evaporites or Pliocene shales. Interpretation of this contiguous dataset across the complex inverted margin of the Maghrebian in the Sicily Channel to the Balearic creates a new correlation framework between these diverse basins. Exploration teams constantly strive to understand the basin framework in order to high-grade areas that align with company strategy and identify proven and future successful hydrocarbon plays. The complexities of the Mediterranean Basin architecture and the variety of play types highlight the importance of understanding the regional tectonic and stratigraphic framework to fully assess the remaining potential in the region. Using a fully integrated Mediterranean seismic dataset that crosses multiple country boundaries, tying mature areas (Sabratha Basin) with less explored areas in Libya, Malta and Italy, makes this interpretation and model refinement possible. Given the current low price environment, it is critical for companies to acquire high quality information in a cost-effective manner. 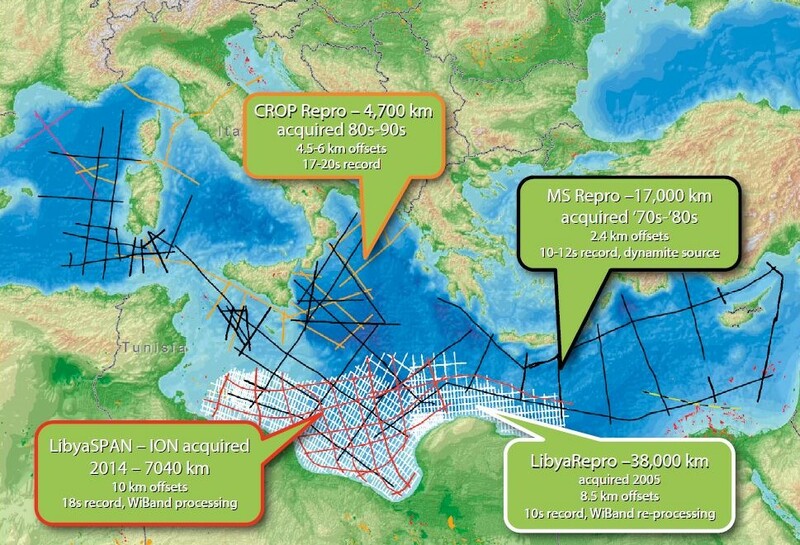 Combining new acquisition with reprocessed legacy data and modern integration techniques, ION has created a dataset that can be used to understand the future hydrocarbon potential in the Mediterranean. Hallet, D., and Clark-Lowes, D., Petroleum Geology of Libya, Elsevier, Amsterdam, Netherlands, 2016. The energy sector in Iraq is predicted to see investment of a minimum of US$50 billion over the next five years amidst a gradually improving security situation, according to a newly released comprehensive report. Ger W. van Graas, Mona Ulas & Jan Roger Schønning; ORG Engineering, Norway, and Joachim Rinna & Jon Erik Skeie; AkerBP, Norway. A newly developed method for detecting petroleum seepage using surface geochemical exploration.